RiveDrill is a riveter or an attachment to set blind rivets with the drill. They automatically transform the energy of the driller into riveting energy plus self-gripping power from the rivet into the hole in the structure. You install as a drill bit and turning to the right set the rivets and turning to the left expell the mandrel. There are several models. For purchase click HERE. Máquinas Andrea manunfacture riveters and fasteners since 1966 in Madrid . RiveDrill is manufactured by Máquinas Andrea and is registred brand. Riveting tools as RiveDrill was invented and patented by Andrés Pérez Aniento. When start the cordless drilling machine, some tools changes. We have developed the riveters RiveDrill, to be used with the drilling machines (not included), to avoid efforts, vibrations on users, cables, air compress hoses and compresors. Remachadoras para taladro con par de giro (torque) asistente. Que son. Como funcionan. Para que se usan. Modelos RiveDrill. Características técnicas. Ventajas respecto a las remachadoras manuales y neumáticas. PDF Catalog. Smart riveter. What it is?, How it works?, Uses, Model of RiveDrill, Terms conditions and advantages respect manual and pneumatic riveters. 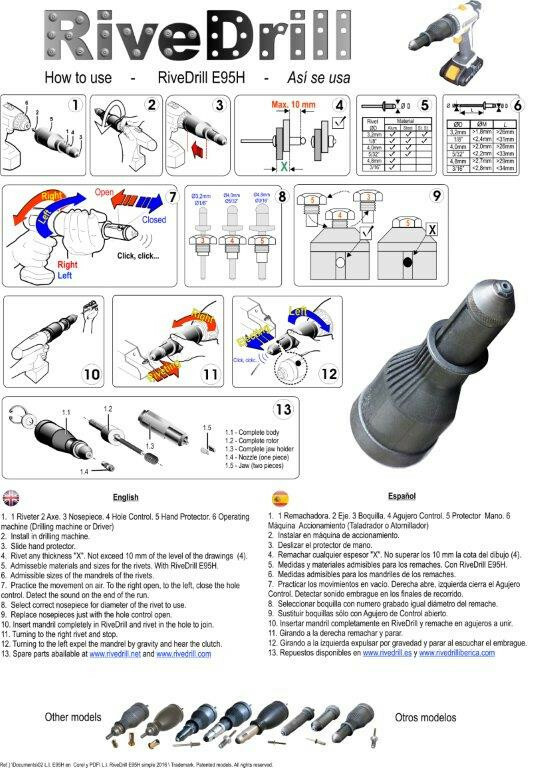 Instrucciones de uso de RiveDrill, mantenimiento, sugerencias y repuestos. Use,maintenance and spare parts. RiveDrill transforms turning power of drilling machine in riveting power. RiveDrill transforms the power, with a light mechanism which weight is between 400 and 600 grams aproximately, that includes a clutch for the end of the run, in some models. Old manual riveting tools need an operator physical effort and produce a disgusting vibration at the end moment when the rivet is set. The pneumatic riveting tools have a limited way of action becasue of the length of the hose for air compress. Blind rivets and nut inserts are always setted into the holes. It is very useful to work with the same drilling machine to do the holes and to set the blind rivets or nut inserts. RiveDrill adaptors to set rivets with drilling machine are a good complement to be included in the tools of the fixing profesional equipment .Rivedrill and drilling machine is the profesional tool equipment, holes and rivets join for ever. Manual and pneumatic riveting tools was created for more than 75 years. We currently have left to manufacture manual riveting tools. Pneumatic tools can only be used in determinate fix points of production. Riveters and berbiquis. Obsoleted tools of 75 years. Use RiveDrill instead of Manual riveting tools or rivet gun you will be always gretaful. The riveters adaptor, RiveDrill, can also been operated by hand with a key in the case that the drill is discharged before finishing the work. Uso y mantenimiento de RiveDrill.